ROA, one of the most recognised names in the street art community graced us with his artistry for our annual International Public Art Festival. He is renowned for his awe-inspiring black and white paintings of wildlife. His murals often feature animals and rodents that are either subject to extinction, exploitation or endangered and are native to the location where the particular mural is found. 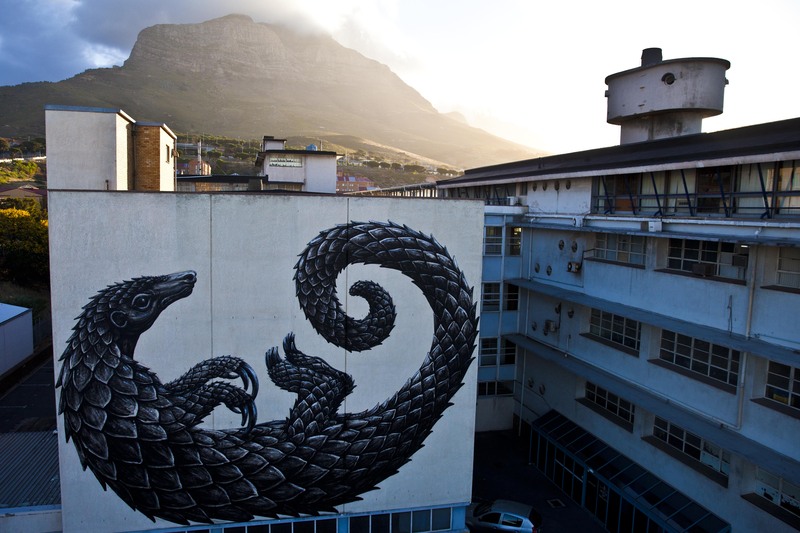 Pangolin by ROA. Salt River, South Africa. IPAF February 2018. The mysterious painter from Ghent is known to keep a low profile so that the quality of his work speaks for itself. 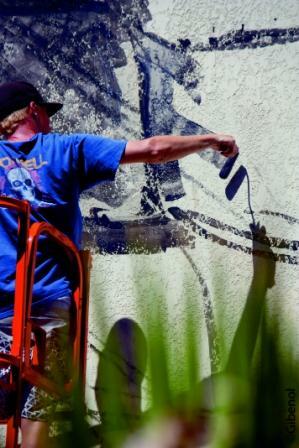 He uses anonymity to make sure his artwork, personal life and spirit remain uncompromised. He has left his marks in some of the most recognised cities such as London, New York, Berlin, Madrid, Moscow, Mexico City, Paris, and Johannesburg. His piece for IPAF festival was a South African “Cape Pangolin” also known as an “Ant eater” which is a mammal with an armour of imbricate brown scales. It is normally found in Savannah Woodlands and has been reported to be the most trafficked animal in the world. Pangolins are exploited because their skin could be used as attractive leather for boots, bags and other high fashion accessories. Their scales are in high demand in countries such as China and Vietnam and across Africa. Its meat too has been considered a delicacy in some areas and an Aphrodisiac in many others. The largest esteemed account for Pangolin exploitation is said to be the African “muthi market” which uses the scales for traditional medicinal cures for a whole range of ailments. Not many people are even aware of the existence of Pangolins in South Africa, which makes ROA’s role crucial for the safeguarding of this near extinct animal. Their nocturnal, underground nature makes it hard to account for how many we still get to protect. What is truly admirable about ROA is the type of projects he chooses to work on. Although he has been approached to do commissioned work for big commercial brands, he filters out projects that resonate with his obsession with animal preservation above those that just pay well. He prefers those not for money as it has less restrictions and allows for open expression of his creativity. Although he lives in Belgium, he only spends a few months out of the year there as his mission to create consciousness about endangered animals sends him globetrotting for most of the year. He now regards wherever he is engaged in the familiar act of painting as his home. We salute ROA for his humble mission of trying to save endangered animals through the power of public art!